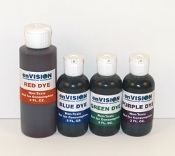 Density Demonstration Dye Kit - Creative Labworks,Inc. The Density Demonstration Kit is a clear and simple way to visually educate students and adults about the different densities of groundwater contaminants such as motor oil, Volatile Organic Compounds (VOCs) and others. The Kit shows how these contaminants will rise to the top of the aquifer, flow with the groundwater or sink to the bottom of the aquifer. A great demonstration for discussion of the difficulties of groundwater remediation. Each kit is supplied with 6 ounces each of colored saline solution, alcohol solution, filtered water and dye for your tap water. The Kit also includes pipettes for transfer of liquids and a specific gravity meter to demonstrate the higher density of the saline solution. Instructions are included. The solutions included in this Kit can also be used in the enVision Groundwater Simulators to demonstrate the flow patterns of "floater" and "sinker" contaminants. These are best demonstrated in the semi-confined aquifer just below the Aquitard.